So funny story… My parents and aunt and uncle were traipsing about with wilds of Michigan’s upper peninsula. Apparently want to cap off the evening and being fond of margaritas, they stopped by one of the local establishments and tried ordering one. Owing to the fact that neither tequila, nor limes, nor triple sec are particularly indigenous ingredients in those northern climes, some improvising was required on the part of their bartender (and hallelujah for ingenious bartenders… except for Manhattans… then don’t get clever). Anyway, what they wound up with, which they affectionately referred to as a “Yupper Margarita” was a combination of Fresca and tequila. When they told me of their adventures, I was pretty amazed that what they had was an actual drink from several thousand miles south of there, the Paloma. I have it on good authority from a friend, preferring to remain nameless, that this is in fact an authentic, if perhaps less than ambitious, drink in Mexico. B & I decided to whip one up today since B was cleaning out the pantry and ran across several bottles of Jarritos grapefruit soda. Pour tequila into glass and squeeze in lime juice. Add ice and salt, fill with grapefruit soda, stir and garnish with a lime wheel. 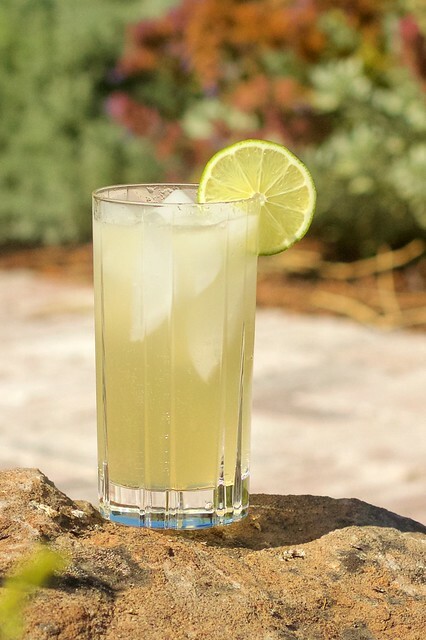 For those warm summer days when the though of coaxing the juice from limes seems to worry the soul more than can be endured, this is an easy and refreshing alternative. Of course, so is a beer and a shot of good tequila.